Activation of T cell immune response through regulation of immune checkpoint pathways is one of the most considerable strategies being employed in cancer immunotherapy, either as individual or in combination. While development of checkpoint inhibitors blocking PD1/PDL1 interaction is still a major interest thereby contributing to the suppression of tumor immune resistance, accurate identification and robust pharmacological characterization of modulatory agents thus become key and should be guaranteed through the assays. We are offering an in vitro PD1/PDL1 blockade assay based on the high throughput HTRF measurement between PD1 and PDL1 partners. Our robust and easy-to-implement assay allows for consistent and reliable assessment of PD1 and/or PDL1 antibodies and modulatory agents, and can thus be used for screening campaigns, identification and functional assessment, as well as potency profiling of candidates. 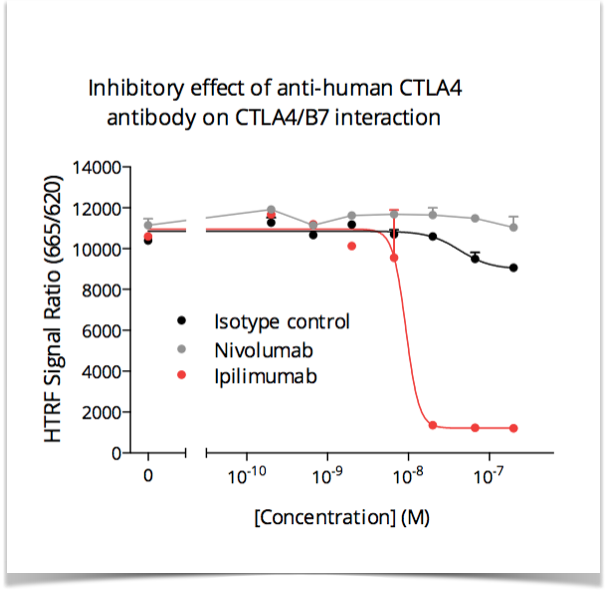 Similar assays are also available for assessing the inhibition of CTLA4 interaction with B7-1 and B7-2 proteins - contact us for further information. Comprehensive characterization could be also pursued through our range of complementary cell based assays.